In Migrations - Part 1 I mentioned Chicomoztoc, the Place of the Seven Caves in Aztec mythology. 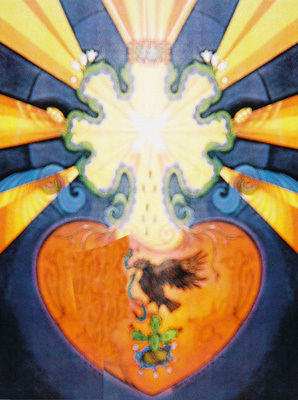 Grandfather Martin showed me a unique painting of the Seven Caves where the Place of Emergence was depicted as a heart (below left -- sorry about the low-quality, it's the only photo I have!) Inside the heart is an eagle with a snake in its mouth perched on a cactus, which in Aztec mythology was the sign the wandering tribe was told they'd see when they reached their destination. The theme of wandering or Migration is a familiar element of many religious systems. In the Hebrew Bible, Adam and Eve "migrated" out of Eden, and the ancient Jews wandered in the wilderness for forty years before being delivered into their Promised Land. The first Muslims migrated from Mecca to Medina and initiated the annual pilgrimage to the Ka'aba (related to Arabic kalb, "heart") which continues to this day. There are many ways to symbolize the journey but each generation has to make it anew using a vocabulary that's relevant to them. From Mount Meru to Mount Zion, the ascent of the mystical mountain has served as a powerful metaphor for the spiritual journey throughout human history. In the present-day Space Age when mountains no longer represent the highest peak of human experience, some people find it more relevant to talk of "Ascent to the 5th Dimension." It is an old story and yet one that remains fresh and vibrantly alive. The 3D world (the "3rd Dimension") is the physical / material universe perceptible to the body's five senses. The 4th Dimension overlaps with this one but inhabitants of the 3rd Dimension are generally unaware of its presence. There are many, many kinds of non-human entities living in the 4th Dimension who are sometimes perceived by 3D residents as as angels and demons -- but there are also the spirits of animals and plants, rivers and mountains, the life-force energy that flows through all of nature. Significantly, inhabitants of both the 3rd and 4th Dimensions normally exist in a state of Duality Consciousness -- "I am me and you are you." Inhabitants of the 5th Dimension, in contrast, exist in a state of Unity Consciousness, perceiving the unfragmented oneness of the Great Spirit that is everywhere and in everything. This is an understanding that is perceived more importantly by the heart than by the intellect. Every true religious path ultimately leads its followers to this experience of Unity Consciousness, of Oneness with All-That-Is. As the saying goes, there are many paths but one destination. By way of conclusion, I would like to stress that the spiritual path is not ONLY about becoming whole within yourself -- having a mental understanding of Oneness and an emotional experience of it. It's also about connecting with the world OUTSIDE of you: family, community, environment, planet. And we live in a world full of people who are hurting each other, hurting the animals, and threatening to destroy the ecosystem itself. This story is still a work-in-progress: we haven't reached the end quite yet. But as a collective group, as ONE TRIBE of humans -- things aren't looking so good for us right now. Just because you -- one little person -- can't save the world, doesn't mean you shouldn't try to help. The Hotevilla Elders were a group of maybe a dozen indigenous men almost no one cared about who tried with all their hearts to save the whole world. I believe their greatest legacy is not the stories and warnings they left us, but the example of how they lived their lives. They never gave up, they never stopped trying. Until the day the world actually ends, it is our duty to do everything in our power to save it.